Mediterranean Salads, two words that go hand in hand. The abundance of vegetables in the summer is a perfect time to include more salads in your diet. Were not talking about plain, boring “filler” salads, but hearty and delicious salads that satisfy. Don’t worry, by hearty I don’t mean full of bacon bits and creamy dressings, but plenty of vegetables, good fats from olive oil and good carbs. I suggest you consume them as a main course, just make a big salad and enjoy with some good bread a maybe a bit of wine and you are set. And of course these salads are full of antioxidants and plenty of fiber. 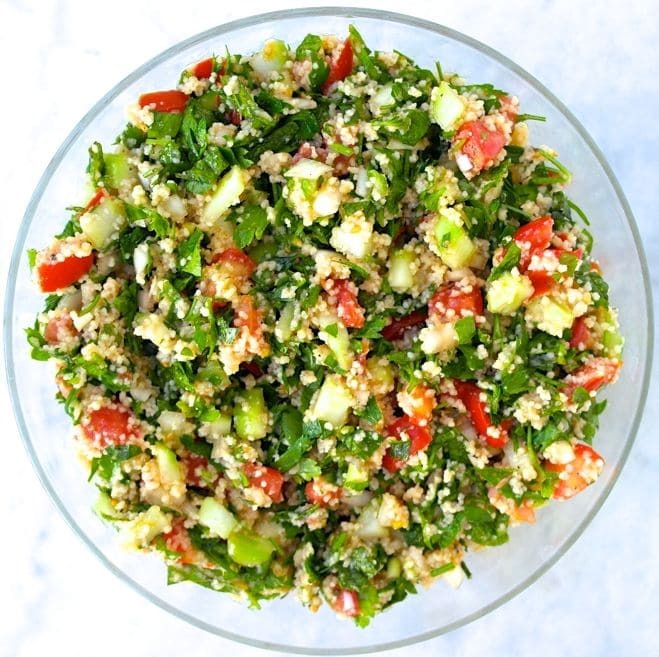 No salad list is complete with this very popular salad. 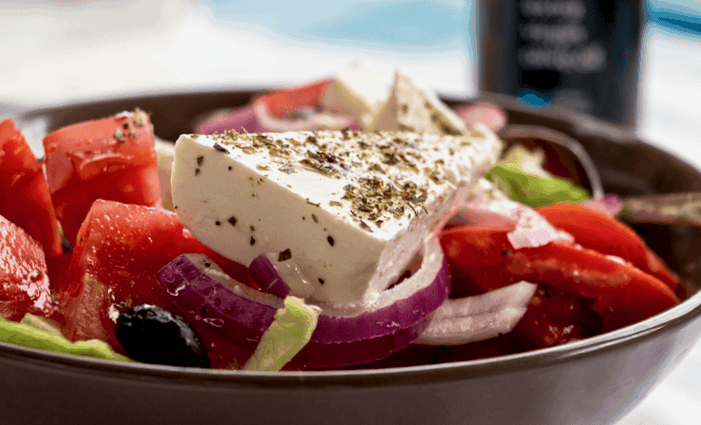 It is a staple of every Greek kitchen and restaurant during the summer. 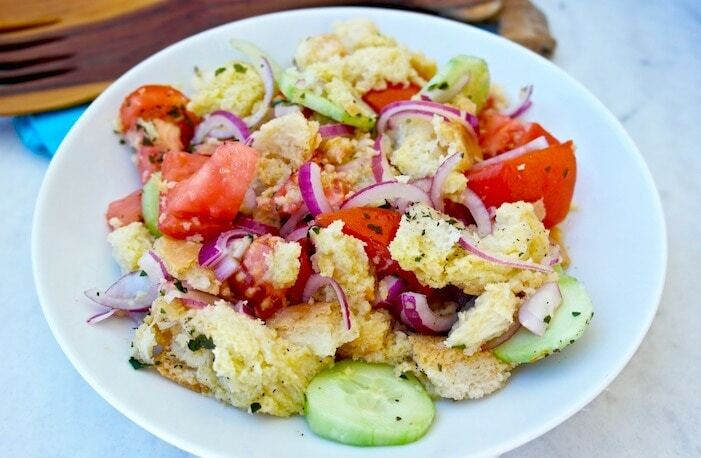 Although it is a simple recipe, details are important: fresh produce, good olive oil, no lettuce and no lemon. 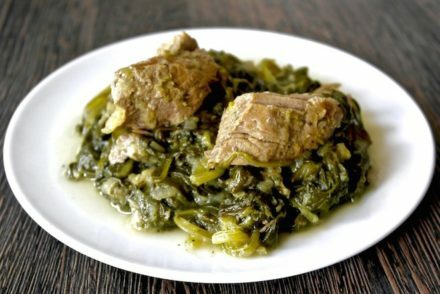 Click here to get the authentic recipe. This is such a great salad. 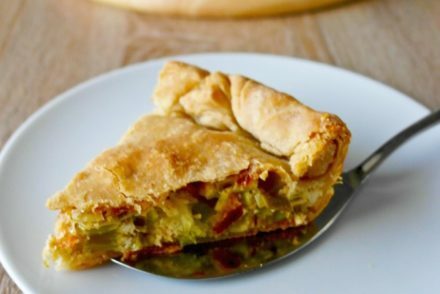 It is fresh and filling and combines all the classic ingredients of the Mediterranean: tomatoes, cucumbers. herbs (parsley, mint), olive oil and lemon. 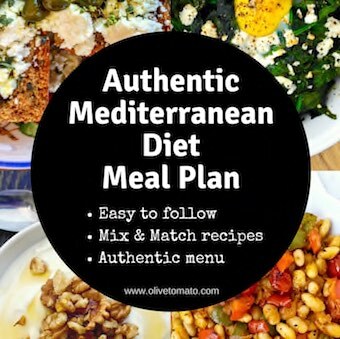 Click here to get the authentic recipe from Greek, Jordanian and Palestinian friend Sophie. This is a salad that was developed by a chef I met in Crete. While not traditional, it combines mediterranean ingredients and the result is amazing. This combo is so good especially when combined with cumin and lemon. 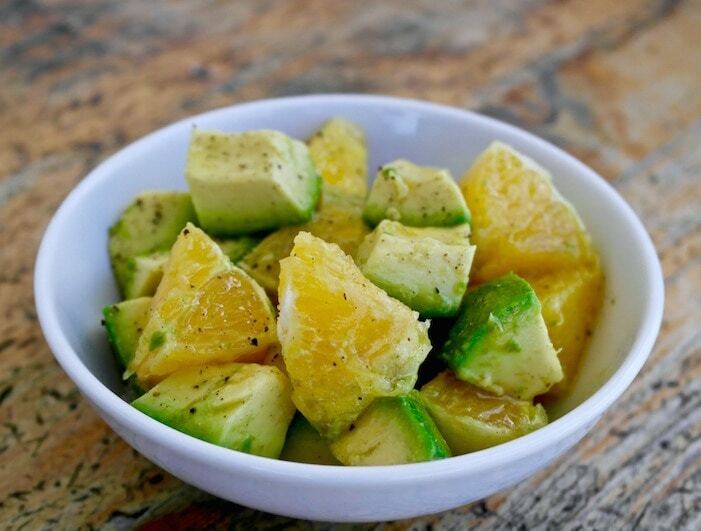 You can also try cutting the avocado and orange in smaller pieces and making a salsa. A popular Italian salad that tastes even better the next day. In the classic version the bread is not in crouton form, you do not actually use croutons, but very stale bread that has been soaked in water. 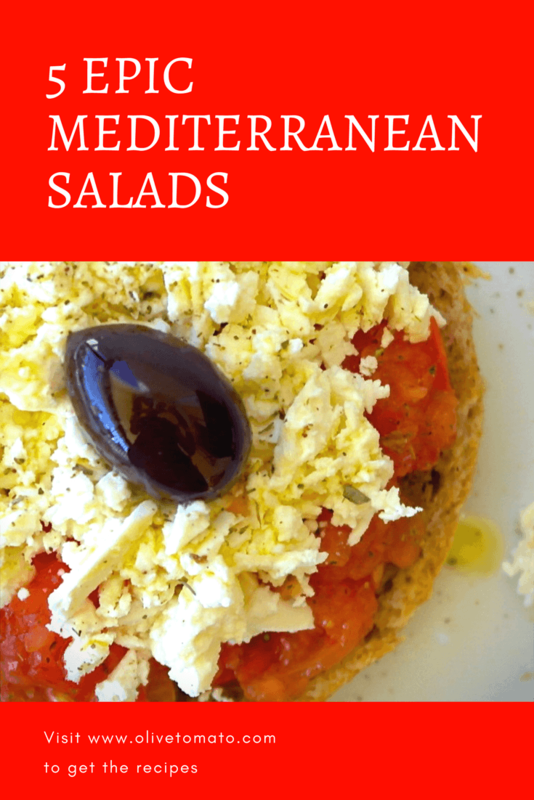 When in it comes to Mediterranean salads, this may be the less known one. 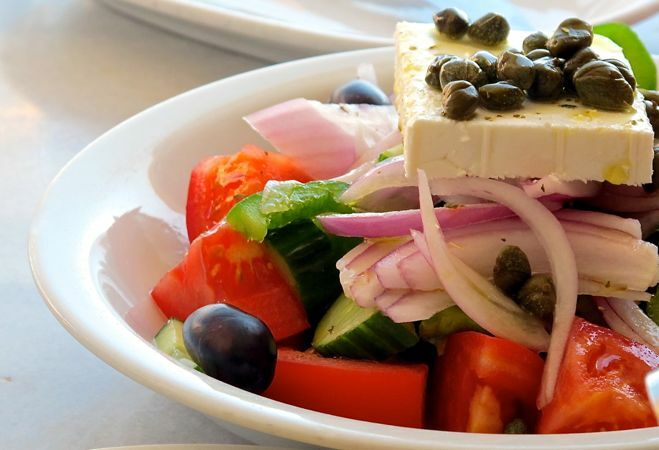 You may not even consider it a salad, but here in Greece we do. 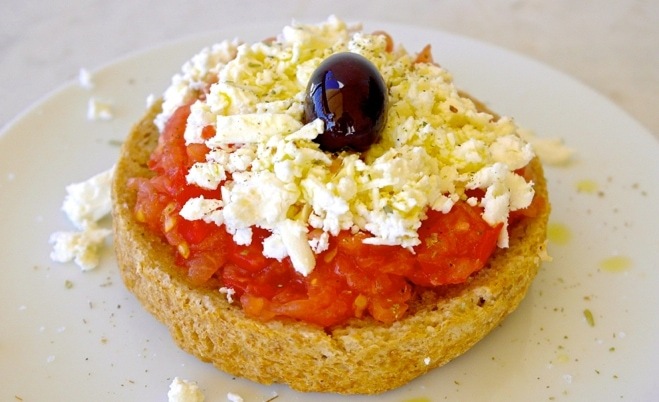 Dakos is basically a barley rusk that is lightly soaked in water is topped with grated tomato, feta (or other white sheep’s milk cheese-in Crete they often use a soft sour cheese), olives (sometimes capers) and drizzled with olive oil. You can find rusks in ethnic stores and you may order online, a quick search came up with this place online. 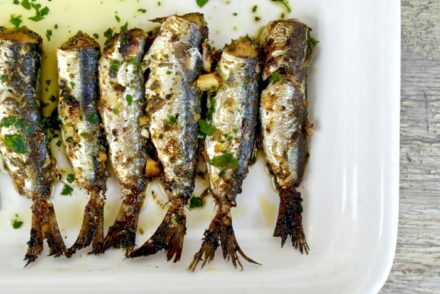 If you are visiting Greece, get them there, as they are cheaper and they have a long shelf life. If you cannot find rusks, use toasted barley bread. Click here for this popular recipe. Do you have a recipe for the Cretan barley risks? I found them at Amazon, but I now make my own bread. Not yet Shirley, but I am working on it.